Our newest duet flame award composed in two brilliant hues of blue art glass, fused in a frosted flame sculpture. 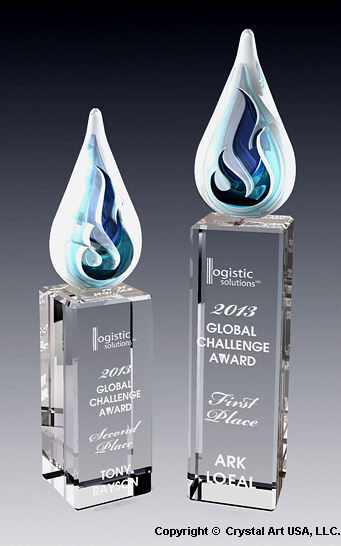 The base of this award is made of clear optic crystal. The Duet Flame award comes in three sizes and is available for three levels of recognition. Our crystal flame awards series are dedicated to those who make the most of themselves by fanning the tiny, inner sparks of possibility into flames of achievement. Select Size Small 9" Medium 11" Large 13"
We recommend up to 8 lines, 20-30 characters per line.